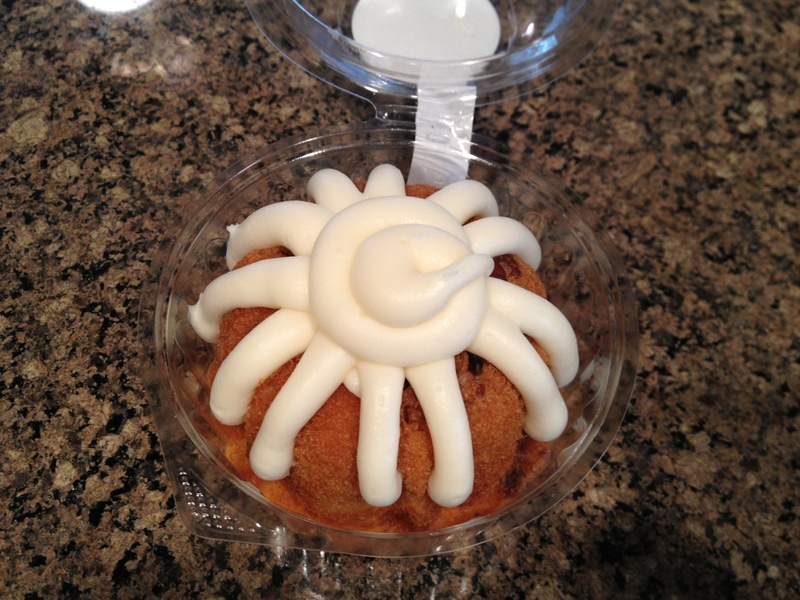 A few weeks ago a friend of mine told me that our local Nothing Bundt Cakes store is now offering a gluten-free version of their beautiful cakes. This particular store location was beautifully done and the edible treats looked delicious. On average, the store regularly offers cakes in the following flavors: red velvet, chocolate chip, white chocolate raspberry, lemon, marble, pecan praline, carrot, white white chocolate, cinnamon swirl, and a featured limited-time only flavor. Cakes are available in bite-sizes by the dozen (bundtinis), an medium individual-size bundt cake, an 8-inch cake, a 10-inch cake, and a variety of other specially-sized creations. The crowning touch of this businesses’ cakes is the amazing icing. It is a thick cream cheese and buttery frosting that is simply delicious! It comes in their signature style or the drizzle style-icing depending on your tastes. On our visit that day, the sales person I spoke with was very helpful. Currently, the store only offers one flavor of gluten-free bundt cake- the chocolate chip cookie dough cake with icing. It was simply beautiful…much like the gluten-filled dessert creations I used to eat before being diagnosed with celiac. That’s something in and of itself…to have a treat that is gluten-free AND looks like art. The cake does come with a sticker that designates it as a gluten-free cake, but it is also noted that the cake is not baked in a gluten-free facility. With that said, I’ve spoken with at least five different individuals that have celiac disease that have been able to eat the cake without issue. Although I’m not a big fan of chocolate chip cookies (I’d much prefer the pumpkin flavor they were offering in regular gluten-filled cakes), the cake was good. The cake had a nice texture and was not crumbly. The icing gave it just the right touch of sweetness. I ate my cake semi-chilled, but the saleswoman did recommend that some customers say the cake tastes even better when warmed in the microwave for about 20 seconds. Because of the cake is offered only in one flavor (and not one that I’m particularly fond of), this is a treat I might do only a couple of times a year. If new cake flavors are introduced in the gluten-free variety, I feel sure I’ll have to revise this statement to reflect more frequent visits! ***If you like my posts and are so incline, please vote for me as one of the top 25 food allergy blogs of 2012 here. My son and I have celiac and were able to eat this cake with no issues. We are gluten-sensitive (not completely gluten-free) and knowing this is out there is going to make the hubby’s birthday so much more special! Thanks for posting!!! Which locations offers Gluten Free cakes? I have a daughter & grandbaby that have celiac disease & they would LOVE to be able to try these cakes! Your best bet is to contact the store closest to you and ask them directly. That said, my understanding is that it is becoming pretty standard for them to offer a gf option. Delicious gluten free cake! Loved my birthday cake! I have Celiac and had no issues. I would like to know what ingredients are in the Choc Chip GF Bundt cake? My Mom had one today and got sick. She is not Celiac but is GF. I could not find the ingredients anywhere. Something in it upset her stomach and blew her up. Thank you. By the way the Red Velvet was delicious for me and the Lemon for my friend. I’m so sorry to hear your mom had a bad experience! I hope she is feeling better. I would definitely recommend contacting the company online to get an ingredient list and/or visiting the store to ask about the odds of possible cross contamination. Sorry I am late to responding to Donna’s comment. I used to work in a NBC bakery. The ingredients in the GF cake are: Rice flour cake mix, water, eggs, canola oil, vanilla extract, & Hershey’s semi-sweet chocolate chips. The rice flour cake mix is a mix that each store receives from corporate and I do not know the exact ingredients in it, however it would contain standard cake mix ingredients including baking powder, salt, sugar, etc. The icing is cream cheese, powdered sugar, and vanilla extract. All of the ingredients come packaged individually and are certified GF before they are opened. I do want to mention that I think the chance of cross-contamination varies greatly from store to store. I have read accounts of people having no reactions to the GF cakes and others of people reacting very badly to them. While the ingredients themselves are strictly GF, the chance of the cakes being contaminated with gluten depends entirely on how the bakers and frosters handle them. At my store, no one besides me (including the manager and the owner of our store) bothered to take any precautions when handling the GF cakes. GF cakes would be turned out onto trays or surfaces where other (non-GF) cakes previously sat (without wiping the surface down first), workers would handle the cakes without changing gloves after handling a regular cake, and frosters would frost them with the same frosting tip as the regular cakes (which often had crumbs of other cake flavors clinging to it.) Even after mentioning potential cross-contamination issues, the owner said it was not their problem because of the warning on the GF cake label and that they were not a dedicated GF bakery so people who ate the GF cakes, did so at their own risk. This morning, before I got out of bed, I was having stomach cramps and then headed straight to the toilet … multiple times! I’ve had other issues today as well so since it isn’t a stomach virus, I would guess they were very careless and I was a victim of cross-contamination. Cross-contamination happens to us from time to time and it can’t always be helped but these reactions were major so someone was quite negligent. I will definitely take them off my list of places that have gluten free items. I’ll just hold off for Outback’s Chocolate Thunder From Down Under from now on. Never a problem with Outback. Don’t forget PFChang’s flourless chocolate dome cake and PFChang has many foods on the menu that are gluten free. Anyone have any experience with peanuts and Nothing Bundt Cakes? They aren’t making anything with peanuts currently but it says everything “may contain traces” of peanuts.